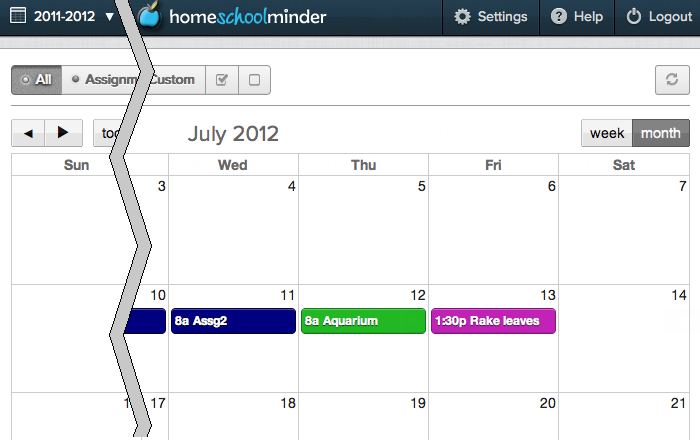 It's easy to let your students view and manage their own tasks by giving them access to the student version of HomeSchool Minder, where the calendar will allow them to see their activities in either a monthly or a weekly view. They will also be able to see the activities for a particular day, as well as mark each activity as they complete it so that you can plan your grading. 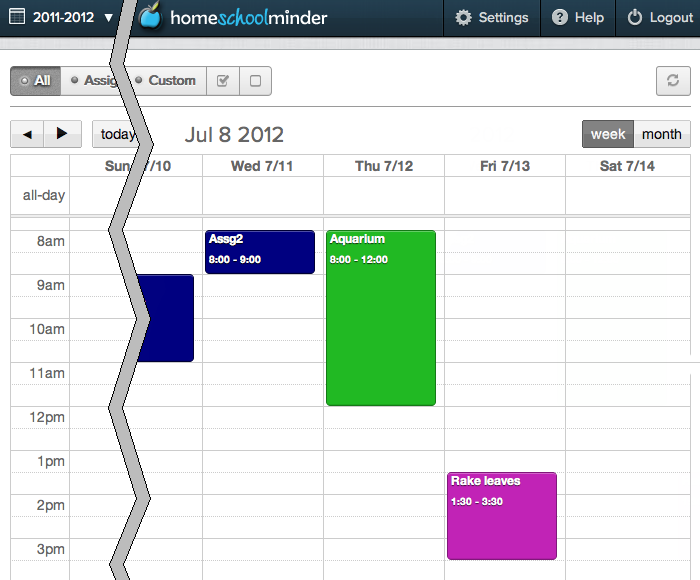 Student access to HomeSchool Minder is managed from the Student Settings page in the application. When you create a new student record, login will be disabled by default for that student. To allow the student to login, first edit the corresponding record. You will see a checkbox labeled "Login allowed". Click on the checkbox to select it and indicate that the student is granted login access. Two data entry fields will appear; enter a login name and a password (you will not be able to save your changes unless both fields are specified). Note that a student's login name must be unique, and you will not be able to save your student's information if the login name you have chosen conflicts with the login name for another student. A good idea is to choose a name including at least the student's first and last names, and for common names it may be necessary to add other details to make it unique. When enabling a login for the first time, you must also enter a password. We recommend that you create a password that is easy to remember for your child, but that is not easily guessed by someone outside your family. Note that you can also manage login access for the current student from the Student Information page in exactly the same way. 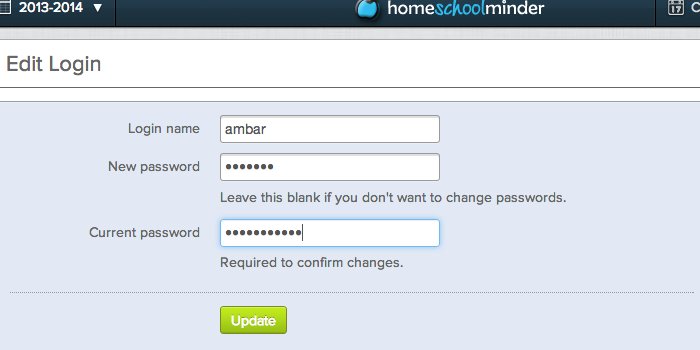 HomeSchool Minder allows teachers to change the login name, password, or both, for each student. If you need to change only the login name for a student, simply edit the student's records in the Student Settings page (for the current student, you can also edit the login information in the Student Information page). Change the login name to the desired value, leaving the password field blank, and save the record (the existing password will remain unchanged). If you need to change only the student's password, leave the login name unchanged (do not erase it) and enter the desired password in the password field. To change both the login name and the password, enter new values in the login name and password fields and save the record. When a student logs into the application, he will have access to the Calendar module. The student's view of the calendar is very similar to the teacher's view. 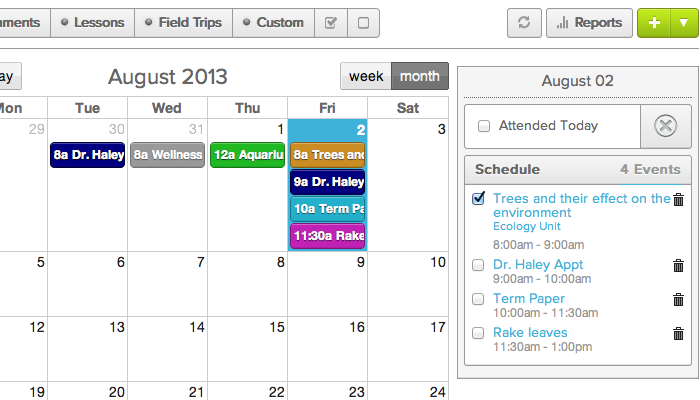 For instance, the student will be able to see either a monthly or a weekly view of scheduled activities. Note that Madeleine will not be able to edit any of the details for the activity, such as the name or description. Similarly, she will not be able to change the time or date of the activity by moving it to another location in the calendar, and she will not be able to change its duration by dragging the edge of its container to resize it. Only you, the teacher, can make such changes. On the other hand, Madeleine can click on the checkbox in the event summary dialog to indicate that she has completed the task and, in the case of assignments, that it is ready for grading. Just as in the teachers' version of HomeSchool Minder, in either the monthly or weekly view students can click on a particular day in the calendar, and they will see the schedule summary for that day, consisting of the list of activities for the day. Unlike teachers, they will not see any attendance controls, nor will they be able to delete activities or view related lesson plans. They can, however, mark completed activities in the schedule summary just as in the activity details dialog. The activity details dialog, which appears when an event is clicked on in the calendar, can also be displayed by clicking on its name in the schedule summary listing. You'll notice that in the top-right corner of the calendar there is a "Refresh Events" button. This event allows the student to request the latest data from the server. For instance, if the teacher has been making changes to activity dates or descriptions, or deleting or adding activities, the student can click on the "Refresh Events" button to see the most recent changes without having to reload the entire page in the browser. You'll also notice that there are two special buttons at the top of the calendar to the right of the event type filter buttons. These buttons allow filtering events by their completion status. Just as you can click on the event type filter buttons to see only assignments, or field trips and appointments, or some other combination of events, by clicking on the completion status filters the student can choose to view only completed activities, or only activites that haven't been completed. The completion filters work in combination withe event type filters. 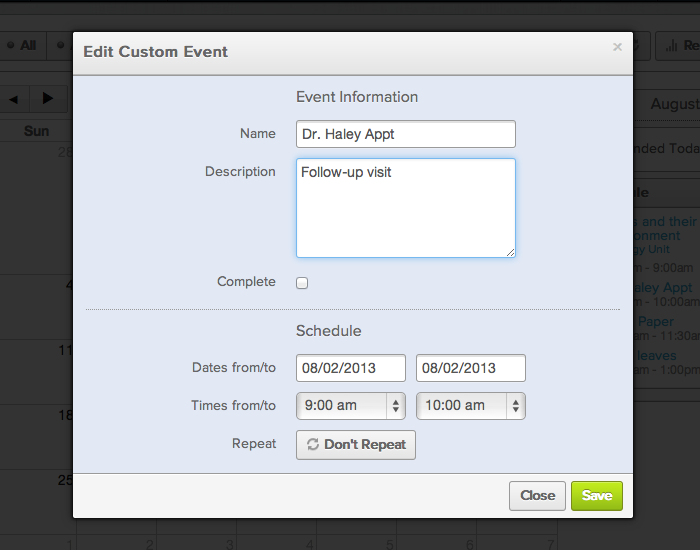 In the example below, the student has chosen to view only custom events (such as chores, appointments and private lessons) that have been completed. Just as in the teacher's view of the application, students can select the current year from a drop-down menu in the application header. Selecting a current year is a convenient way to navigate in the calendar to a date within the selected year. 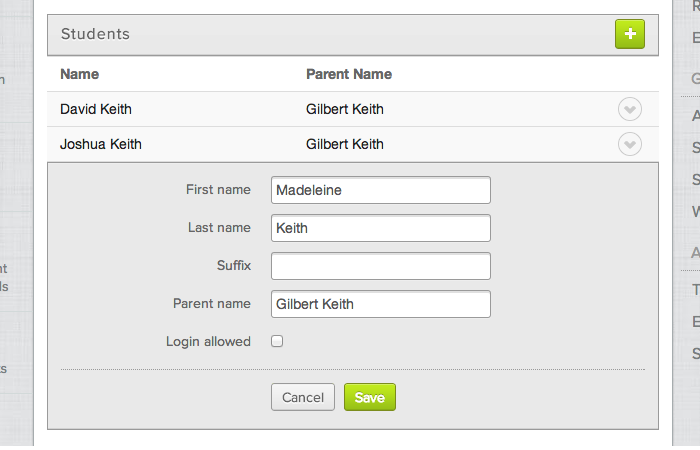 HomeSchool Minder allows students to set their own login name and password. To do this, they can click on the "Settings" button in the header bar. This will display the "Login and Password" page. The student can enter a new login name, or a new password, or both. If the student does not want to change the password, then the "New password" field should be left blank. Similarly, if the student does not want to change the login name, it should be left as is (it must not be erased). Note that, to change either the login name or the password, the student must enter the current password. If the student has forgotten the password, then a new password has to be set by the teacher in the Student Settings page. To navigate back to the calendar, the student can simply click on the "Calendar" button that will be displayed in the application header bar when the "Login and Password" page is visible. The ability for students to log into HomeSchool Minder introduces a few minor changes to the teacher's view of the application. First, since students and teachers can be logged into the application and making changes simultaneously, teachers also have a "Refresh Events" button in the calendar. In this way, teachers can request see any tasks that have been recently completed by each student without having to navigate away from the calendar. Second, the teacher can also mark activities complete or incomplete as necessary. Checkboxes for each activity are included in the Edit dialog for each event, the calendar schedule summary, and the gradebook. Finally, the teacher's calendar also includes completion status filter buttons, so that particular combinations of events can be selected while other events are hidden from view.